Awwwww! The Boogie man is a sucker for a pretty girl (especially if she has a carrot). This picture was taken at the open house. At one point we had easily a dozen kids in the barn, petting horses and feeding alpacas crumbles. Dad’s hard work getting the ‘pacas used to eating crumbles from his hands paid off! They weren’t born with Boogie’s trusting nature, but they’re starting to get the idea. Boogie’s such a sweetheart. I was getting him for morning turnout the other day and he walked up to me and pressed his head to my chest, wanting me to hug his head! Odd behavior for a prey species, but adorable for a pet. 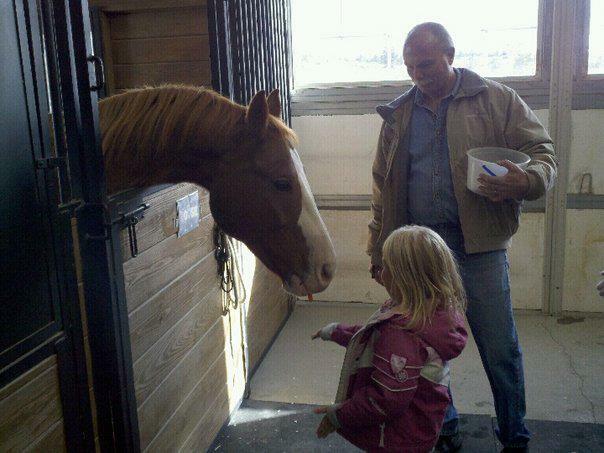 This entry was posted in animals and tagged alpacas, carrots, horses, kids, treats. Bookmark the permalink.